Welcome back to Taylor King Law’s Arkansas Adventures series, where we highlight things to do and see in some of the cities that make our state a great place to call home. In this week’s edition, we’re visiting the second-largest city in Arkansas: Fort Smith. Begin your visit at Miss Laura’s Visitor Center in Fort Smith’s historic downtown area. Miss Laura’s was once a bordello in Fort Smith’s Old West red light district (we told you their past is colorful!) and is now on the National Register of Historic Places. You’ll get the grand tour of this Victorian mansion, restored to its former grandeur, as well as great information for the rest of your stay. The Fort Smith Farmer’s Market, open every Tuesday and Saturday, provides a taste of the town in more ways than one. More than 90 vendors offer fresh fruits, vegetables, and homemade goods in peak growing season. Your family will also enjoy the street performers and local musicians who provide entertainment for the market’s many visitors. Take your farmer’s market bounty to enjoy in The Park at West End, a charming historical park in downtown Fort Smith. For a mere $1 each, you can take a ride on the Ferris Wheel from the 1935 World’s Fair and vintage carousel hand-painted in Italy. The park also features a refurbished Pullman railcar diner and double-decker bus transformed into a concession stand. 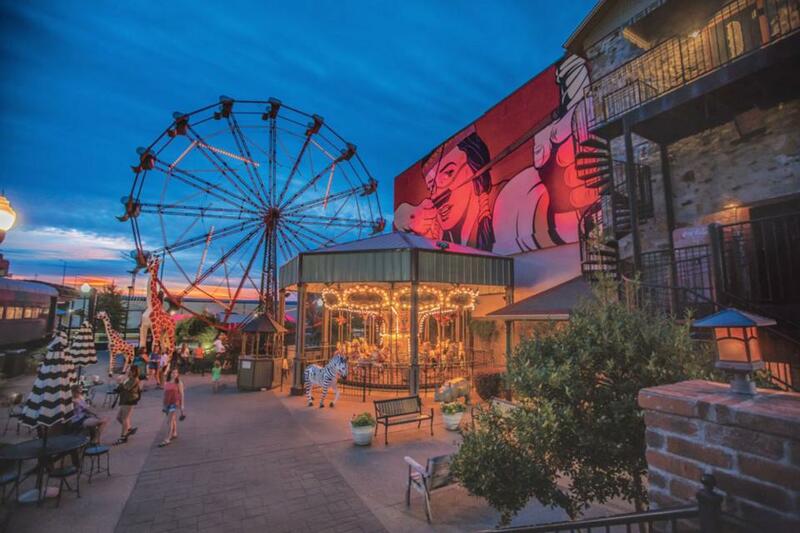 Fort Smith also proves that you don’t have to leave Arkansas to find amazing art; it’s home to many murals and art installations by well-known artists. Along the city’s streets you will find murals and installations by Francisco Diaz (an Argentinean artist known as Pastel), Ana Marietta, Icelandic artist Guido Van Helten, Spanish artist Okuda San Miguel, and more. Fort Smith is not lacking in history. If you’re interested in American and Arkansas history, this is one city you won’t want to miss. Fort Smith’s long history as a military base, fur trade center, and central settling point during the “Wild West” period makes it a unique hub of educational and enlightening experiences. If you’re looking for the oldest building still standing in Fort Smith, that would be the Commissary, where the infamous Judge Parker handed down sentences to Wild West Outlaws. A replica of the Fort Smith Gallows, where these sentences were carried out, is also on the site. You can learn about another sobering piece of America’s history in Fort Smith: it was part of the route called the Trail of Tears, along which five Native American tribes were forcibly removed from their homelands by the United States government. The Overlook holds exhibit panels telling the tribes’ stories. For a bit of lighthearted fun, head to the Elvis Barber Shop Museum, where the iconic singer received the “haircut heard ‘round the world.” When Presley put his music career on hold to serve in the U.S. Army during World War II, he said goodbye to his famous sideburns and received the standard military buzz cut. The museum tells his story. In Fort Smith you’ll also find the opportunity to take a railroad excursion. The Arkansas and Missouri Railroad’s special passenger trains offer a window into history for your entire family. There are few lines like this one remaining in operation today! You can choose from three popular routes that take you through the Arkansas River Valley and Ozark Mountains – and back again! While we hope that all of your summer travels bring you home safely, we also know that accidents happen. If you or someone you love has been injured in a car wreck in Arkansas, you’re not alone. Taylor King Law is here to help. Stop by our Fort Smith office at 2222 Rogers Avenue, Suite D today to begin your FREE, no-obligation consultation. You can also call us toll-free at 1-800-227-9732 or submit a case form on our website.